This is actually the norm at racetracks all over the world. The racehorse collapsed at the finish line. He'd injured his left foreleg, fracturing the bone near his fetlock joint at the base of his leg. People rushed over, holding up large green tarps to prevent the crowd - as well as those watching the race on TV - from seeing the horse in pain. Eventually the tarps came down. The horse - named Red Cadeaux - had gotten to his feet and trotted toward an ambulance trailer. 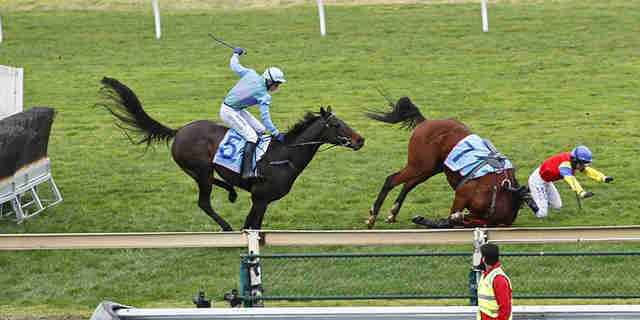 The crowd cheered, probably believing the horse was going to be OK. A couple days later, Racing Victoria even announced that Red Cadeaux was "comfortable" and his fracture was "stable," and that Dr. Chris Whitton from the University of Melbourne believed his injury was "not currently life-threatening." Then, a few weeks later, the public got a different story: Now Red Cadeaux's leg injury was "irreversible," and he was euthanized on November 20, 2015. Red Cadeaux was the fourth horse to die in the last four years of the Melbourne Cup, Australia's famous - in some ways infamous - horse race, which takes place in November each year. In 2014, two horses - Admire Rakti and Araldo - died after sustaining race-related injuries. In 2013, a horse named Verema was euthanized right on the racetrack, although green tarps prevented the crowd from seeing what was happening. At this year's Melbourne Cup, which took place on Tuesday, no horses died - but many were expecting them to. In fact, an Australian broadcaster released a satirical piece weighing which horse would be most likely to die. While many people are appalled by the deaths of these horses, the Melbourne Cup continues to hold mass appeal in Australia - there are office parties, booze-filled luncheons and cash wagers. About 100,000 people attend the Melbourne Cup in person, and millions watch it on TV. The race also makes the Australian state of Victoria a lot of money. In 2014, the race made approximately $194.9 million AUD (about $149 million USD) in revenue, according to a racing industry report. But horses pay a high price for this profit - not just at the Melbourne Cup, but in all Australian horse races. 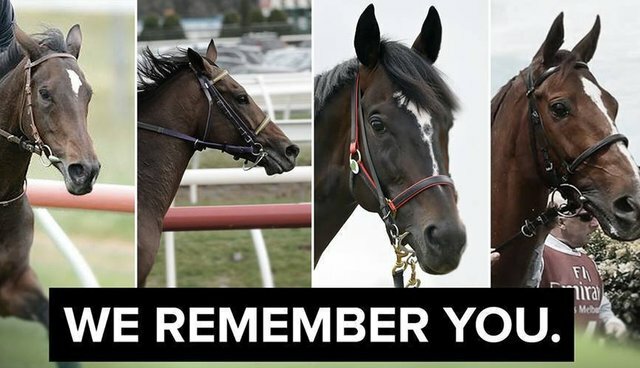 In 2015, 132 racehorses died in race courses across Australia due to repeat injuries, according to the Coalition for the Protection of Racehorses. That's about one death every three days. When horses can't race anymore, they're "retired," but this doesn't mean they're sent to grassy fields to graze and sunbathe. "Retirement" usually means slaughter. In Australia, horsemeat is mainly used in dog food, but some is sent to Belgium or France for human consumption. It's not only "retired" racehorses who are slaughtered - young horses who never make the cut are sent to their deaths as well. For instance, if a horse is deemed "too slow" or "too untrainable," or just doesn't have the right physique for racing, he will most likely be sent to the slaughterhouse. Over 25,000 Australian horses are killed in slaughterhouses each year, according to Animals Australia. What's more, horses usually have to watch their friends and family members die while they wait to be killed. In the U.S., racehorses aren't treated much better. There were 484 horse fatalities on the racetracks in 2015, according to the American Jockey Club. 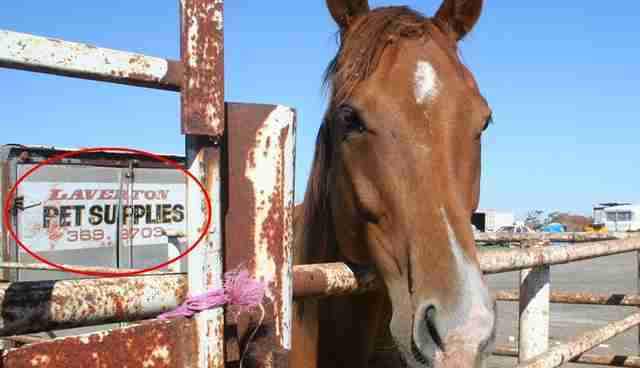 While there are currently no horse slaughterhouses in the U.S., horses continue to be shipped to slaughterhouses in Mexico and Canada. Of course, it's not just ex-racehorses who are slaughtered - any horse who is deemed "invaluable" will be sent there. Based on a report from the Animal Welfare Institute, 125,608 American horses were sent to slaughterhouses in Mexico and Canada last year. The Melbourne Cup may be over for the year, but horseracing continues year-round, claiming hundreds of thousands of lives. To help horses in Australia, you can sign this pledge or donate to Animals Australia. You can also appeal to the U.S. Congress to stop exporting horses to slaughterhouses.